What Happened To The Gay Version of The Bible?? 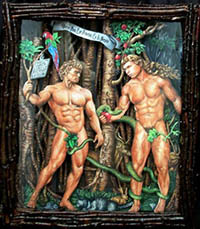 A “gay-friendly version of the Bible was said to be in development last year (note: it turned out to be a hoax). But let’s just fantasize for a minute shall we?? Am I the only MadMan that find this absolutely hilarious??? The Christian conservatives would have a collective heart attack should something like this ever hit the shelves. No longer will they be able to quote Bible verses to drive their judgmental ideologies home. Now a gay American can say “well the Bible says….” with just as much authority. I beg someone to strike now while the iron is hot and take up this task in the new climate Obama created with his recent announcement on gay marriage. I for one would personally sit back and enjoy the ruckus. Reminds me of the old school Bible story of the Tower of Babel. Previous Post Previous post:Who Are The Agencies Behind Keeping Marijuana Illegal? We have the List! The piece of art accompanying your article is called “The Private Lives of Adam and Steve” and was done by Ross Johnston (me). I have no problem with you using it (some credit would be appreciated) but have to ask where you pulled the image from. Please spell my name right lol!